Interesting Boats: Boat Powered by Human Fat! A lot of people may not be aware of the Earthrace project. Basically, it's a low-carbon footprint attempt at breaking the round the world power boat speed record. The boat, pictured above, is a wave-piercing design, powered by Cummins diesels burning 100% bio-fuel. In fact, the boat isn't actually planning to make this trip on human fat. Truth is, the captain and innovator of this project, New Zealand entrepreneur Pete Bethune, underwent liposuction and donated some of his own body material to produce 100 ml of fuel. Two other volunteers chipped in to bring the total human fat contribution to a level equivalent of seven liters of fuel, about 15 km worth of steaming. This is something to consider if you're ever out there and run out of fuel. Instead of calling the Coast Guard or SeaTow, you can harvest a little of your own fat content and jam into the fuel tank. Leave it to a New Zealander to give everyone a new perspective on the alternative fuels issue. Meanwhile, nobody's shoved off yet. There have been some delays, and the boat is still undergoing sea trials. If anyone is interested in donated their own fat to the project, I would recommend they contact the project team directly through their website. 1. Flooding started in the rudder room, which had always been a problem area on this vessel. 2. 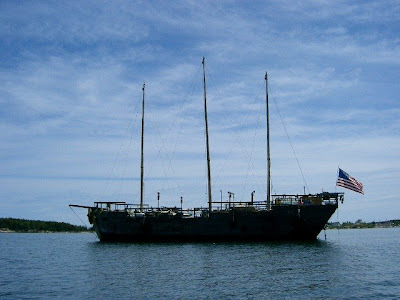 Vessel was a converted oil patch boat. Former captain considered her top heavy for a fish boat. 3. Crew told not to talk to the press by vessel's owners. 4. 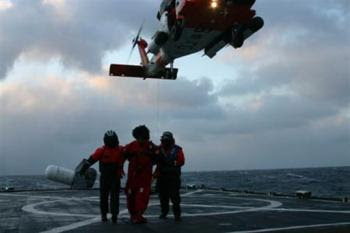 USCG crews undertook a brave and highly successful rescue. Individuals of the Coast Guard went above and beyond in rescuing crew. 5. Captain of Alaska Ranger made sure everyone put on their survival suits before abandoning ship. 6. Captain and 3 crew, including engineer and first mate, were the last to leave vessel. They apparently died of hypothermia after 6 or more hours in the frigid water. 7. Seas were in the twenty foot range, which isn't uncommon for the area this time of year. 8. It was cold enough to make ice. There was a report the deck of the other vessel, Alaska Warrior, which arrived to assist, had ice on its decks. The ice prohibited the Coast Guard Helo on scene from using the Warrior as a rescue platform. 9. The Alaska Range sank in 15 minutes in over 1,000 fathoms of water. Questions about the cause of the vessel's foundering will remain open for some time. However, we can speculate that even if the entire rudder room was flooded, there had to be something else not quite right to cause the vessel to sink so quickly. Our condolences to the family and friends of those who were lost. And our thanks to the men and women who assisted in the rescue of those who survived. Photo above is from the Monroe Country Sheriff's Dept. in Florida. 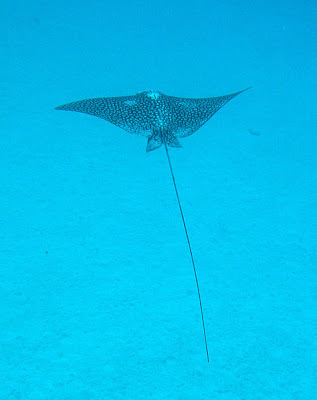 It is not the spotted eagle ray involved in the accident, which you can read about a few posts down. However, a coroner's report concluded the ray had jumped out of the water, and the boat and its passengers, which was traveling at approximately 25 mph, essentially drove into it. The animal hit a young woman, who tragically sustained fatal injuries to her head. It's a freak accident for which nobody should assume or assign fault or responsibility. Spotted eagle rays and other types of fish often leap, jump, or catapult themselves out of the water. Rarely do these occurrences impact those of us who enjoy working or recreating in and around the water. I personally find encounters with ocean creatures life affirming and inspirational, which -- added to the fact that the woman who died was reputed to be a wonderful person who volunteered her time to terminally-ill patients -- makes this particular story even more tragic. Alaska Ranger Sinks, 4 Dead, 1 Missing, 42 Rescued! The crew reported rudder problems before contacting the Coast Guard. Catastrophic flooding seems to have led to a loss of power (emergency pumping) and stability. Wherever the problem started, lazarette, engine room, it would have to breach two or more compartments to become catastrophic, because a vessel this size would have multiple watertight bulkheads. Kudos to the men and women of the Coast Guard and the other trawler (owned by the same company that owns the Alaska Ranger) that assisted in the rescue. According to the article by the AP, the dead were the captain, chief engineer, first mate, and a crewman. A fifth man is still missing. One of the men killed, or the one who is missing, it's not clear which, was lost in the process of being rescued. The other three, the captain, first mate, and chief engineer, and possibly the fourth, may have died while trying to save the vessel and/or give the remaining crew time to safely abandon ship. I'm sure the details will be available in another day or so. Special Life Rafts for Training! Here's a very interesting but little known fact about vessel safety equipment. We all know that certain vessels are required by law to carry inflatable life rafts and/or other types of survival craft, e.g. lifeboats, rescue craft, etc. These life saving vessels must be inspected and certified every so many years, usually no more than two or three at the most in the case of inflatables. The cost for this inspection (and repacking of your life raft) depends on the capacity of the raft and whether or not it is SOLAS equipped. However, no matter what type of certification it has, no matter its size, repacking is expensive. In fact, for many mariners, particularly owners of small boats that are not required to carry survival craft, repacking and inspection costs are prohibitive. Here's another thing. The equipment aboard every vessel, regardless of its type or classification, must be approved, inspected, certified, current and up to date and in operating condition. If you have aboard your vessel a broken radar, an expired fire extinguisher, outdated flares, or a life raft in need of inspection and repacking, your vessel is non-compliant. But here's where a loophole in the Code of Federal Regulations might help you out and might save your life. (5) On board training in the use of davit-launched life rafts must take place at intervals of not more than 4 months on each vessel with davit-launched life rafts. Whenever practicable, this training must include the inflation and lowering of a life raft. 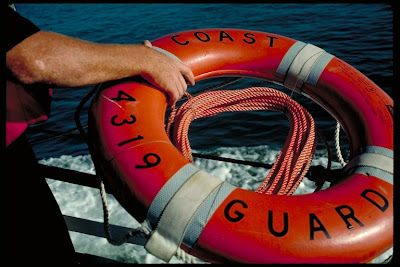 If this life raft is a special life raft intended for training purposes only and is not part of the vessel’s lifesaving equipment, this life raft must be conspicuously marked. This means you can still be compliant even if you have a life raft on your vessel that has not been repacked and/or inspected, provided the raft is conspicuously marked FOR TRAINING PURPOSES ONLY. If I'm not mistaken, all commercial fish boats and all commercial passenger vessels on routes more than three miles from shore in cold waters must have an inflatable life raft aboard. These rafts must be inspected and certified and must be 100% complaint and ready to use in an emergency. But if you're not one of these vessels, and you want to have a life raft with you without having to spend $800 to $1200 every two or three years, you can still carry one as long as it is clearly marked as indicated above. I'm not advocating circumventing sensible safety rules. Because there's no guarantee your raft will open the way it's supposed to when the time comes if it hasn't been inspected and repacked. That said, there are no guarantees -- period! I know of one mariner who had a number of dead flares in a freshly repacked raft. Let me add that I have popped the cork on two life rafts that have gone well past their expiration dates and neither one of them failed to open. Similarly, a good friend who conducts routine training exercises with the U.S. Coast Guard informs me that he has personally fired off hundreds of long-expired flares without a single failure. This speaks highly for the manufacturing quality of our safety gear, but maybe not so highly for the integrity of our manufacturers and regulatory organizations. Let me again repeat myself: I AM NOT ADVOCATING CARRYING NON-COMPLIANT SAFETY EQUIPMENT! If you are required by law to carry an inspected life raft, you better have one. Moreover, chances are you can trust one that has been repacked and inspected more than you can trust one that hasn't. On the other hand, I'd rather have a non-compliant life raft aboard than no life raft at all. Despite what appears to be overwhelming and bipartisan opposition, FERC, the Federal Energy Regulation Commission, today approved a plan by Broadwater to build a floating LNG terminal in Eastern Long Island Sound. Curiously, from what I can gather on the Net, the recently dethroned Gov. Spitzer of New York was in favor of the construction. I'm guessing he won't have much influence in the decision-making process now that he's been outed as a spend crazy horn dog. In fact, his replacement, David A. Paterson, who has held office for only a week or so, just announced he is placing the issue on the back burner, until a more thorough study by his new office can be conducted. (The Broadwater plan will require final approval by the two states, New York and Connecticut, that have territorial control over the waters. When you think about it, it's kind of a slap in the face for FERC to spring this on the newly appointed Governor. If I were him, I'd tell the feds to take a ticket and wait until called. I'm not sure what if anything Broadwater and Spitzer had in common, but I think it's safe to say they both spent a lot of money on acquiring favors. If I were asked to make a recommendation here, it would be to suggest to analysts to consider the traffic in this area of Long Island Sound. Forget for a moment the environmental issue, the safety issue, the security issue, and the aesthetic issue, all good arguments against the plan. What about the traffic? If you check USCG archives I think you will find an inordinately high number of marine casualties reported from this area. I'm not saying it's the Long Island Triangles mind you, just that if I was looking for a parking space on a windy day, I wouldn't choose one under a dead tree. In today's environment of skyrocketing commodities and oil costs it makes sense for every boat, ship and fleet owner to adopt maintenance and other methods for improving efficiency and increasing vessel longevity. While many techniques are well known to the owner, some may not be as obvious. Here's a brief list of things that can be done to help reduce operating costs and extend a vessel's lifespan. 1. Everybody knows that keeping the hull clean and freshly coated with anti-fouling paint helps reduce operating costs, but do you know that polishing the wheel will also help reduce fuel costs? Ship owners are now conducting more frequent propeller polishing. One fleet owner claims the practice of polishing the wheel every four months instead of the usual six months has saved 1 ton of fuel every 24 hours of operation in a vessel that burns on average 128 ton every 24 hours. 2. Down time should be used wisely. Nothing causes deterioration faster than humidity, moisture and standing water, especially sea water. The easiest thing in the world to do is open hatches and doors on a bright, sunny, dry day. Clearly, ships in the combustible fuels transportation business don't have the option of opening all hatches and doors, but the rest of us, especially those of us with composite vessels, can really benefit from the practice. When dockside or on a mooring, open hatches and doors and let the thing dry out. 3. From a safety standpoint, it's always a good idea to shake the hell out of your ABC Dry Chemical fire extinguishers, then turn them over and shake them again. When mounted in their usual brackets the extinguishing material inside tends to compact at the bottom, especially with the continual pounding of the vessel in head seas. If you had to use one that had been standing untended for a long time, if you hadn't shaken it up, the first few shots you would get out of it would be compressed gas. 4. Winterizing a small, heat exchanger cooled diesel engine is a concern to every small boat owner in the northeast. What most people do is run non-toxic anti-freeze through the main engine intake until they see it come out the exhaust. This is truly the best way to do it, rather than by pulling the zinc plugs and/or draining the seawater out of it. The reason for this is that even though you may leave the engine empty of seawater, over the course of the winter, condensation will build up in the cooling circuit. For an even better sleep at night, use minus 100 degree anti-freeze protection. 5. Here's another no brainer: Keep your filters fresh: Air, oil (engine and transmission), oil sump re-breather, fuel (both primary and secondary), spinner (centrifugal), coolant (if you have one). Forget the negative effects of dirt, which are bad enough, the harder the engine has to work to move air, fuel and lube oil, the shorter its lifespan. 6. Back to the propeller. No amount of polishing will help reduce fuel consumption and increase engine longevity if you have a vibration issue with either prop, shaft or transmission. Identify vibration issues and rectify them. 7. Fair the hull. Don't skim on anti-fouling coatings; keep them smooth and functional. While you're at it, make sure all your protruding through hull fittings are equipped with fairings. The smoother and cleaner the path for water to the propeller, the better your performance and fuel efficiency. That's it for now. I'll be adding to this list later. Wilh. Wilhelmsen (WW) and Wallenius Lines (OW) have agreed to buy eight new large car and truck carriers (LCTC), four from Hyundai Heavy Industries and four from Daewoo Shipbuilding & Marine Engineering. The LCTCs will be deployed in WW and OW’s joint venture Wallenius Wilhelmsen Logistics' global trade. The vessels will be 228 meters long and have a car carrying capacity of 8 000 units. The vessels will have the latest design, to meet the service and cargo requirements of Wallenius Wilhelmsen Logistics' customers. 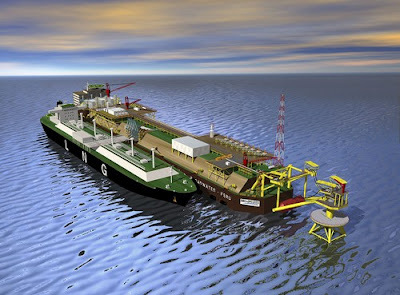 Seven of the vessels will be delivered in 2011 and one will be delivered in 2012. Having environment as a top priority, the vessels will have environment-friendly technology, reducing emissions to the air and to the sea. WW and OW will own four vessels each. In order to ensure new and modern tonnage, WW and OW are pursuing an extensive newbuilding programme. The order book for the group of companies currently comprises some 45 vessels to be delivered through 2012. News above is in addition to the four Ro-Ro's -- reputed to become the world's largest -- ordered by the same company from Mitsubishi Industries in Japan. The new vessels will have a cargo capacity of 138,000 cubic meters, roughly 10% greater than the next largest vessel. USCG's Top Ten Drug Busts! Lots of talk in the news today about the increased use of semi-submersibles in the drug trade. Million dollar fiberglass or steel vessels from South America transiting the Caribbean for the US Coast. Semi-submersibles are a lot stealthier and harder for the CG to pick up on radar. However, as you can see in the video from one of the busts, they are not invisible. The video is a little long but check out the second to last bust, about 5:00 minutes in. That's my favorite. Interesting Boats: Is This a Real Lobster Boat? National Fisherman magazine covered the launching of the lobster boat pictured above in their March issue. If you want the full story, you'll have to contact NF because I think the March issue is already off the stands. Meanwhile, I'll tell you what I can remember from reading it. When I first saw the photo on the cover I thought it was an April Fool's prank. Magazines do that sometimes. They'll have a pull-your-leg story in the issue in time for April. Offshore magazine did it years ago with a story by Dave Gerr on making your propeller more efficient by drilling strategically placed holes in it. Very funny story. Not so funny for Herb Gliick, the founder and publisher, who had to field a bunch of telephone calls from angry readers who had drilled holes in their expensive propellers. However, this NF cover is no prank. This is a real commercial fishing boat built in Canada by a veteran commercial fisherman and a well-established yard. What can I say? If it's not the ugliest boat that ever sailed the seven seas it must be the ugliest boat's ugly cousin. 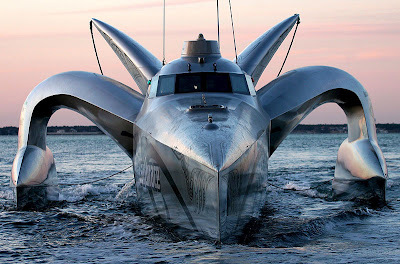 No, seriously, I think this is the ugliest boat I have ever seen in my life. Granted, in Canada, fisherman have to build their boats short and squat in order to stay within their legally mandated size limits. But this is just ridiculous. If I recall, the boat measures 49' in length by 29' in width. The wheelhouse deck is about 20' off the water, which gives you an idea how tall it is at the top of the mast. If this boat was any taller and squatter it would look like a two story building on Main Street. I think the article mentioned that she carried 37,000 pounds of concrete as ballast, a detail that shouldn't surprise anyone. Another detail that shouldn't surprise anyone is the captain/owner's comment that she is a bit tricky to get into the dock. One of the things I noticed in the photos that immediately caught my attention was that there were two non-watertight doors on the main deck but a watertight door on the second deck leading into the aft end of the wheelhouse. I'm not sure of the logic there. Trust me, I'm not against Novi-style boats. I love 'em. I even own one. This is not a Novi. Or maybe it's a Novi on steroids. Who am I to say? It might be the best work boat ever made for bugging. Time will tell. Anyway, if you want to see a beautiful boat, click here. PS. Note to NF: What the hell were you thinking putting this on the cover? What ever happened to the days when NF featured stories and photos of the best and most beautiful works of commercial fishing and boat building? 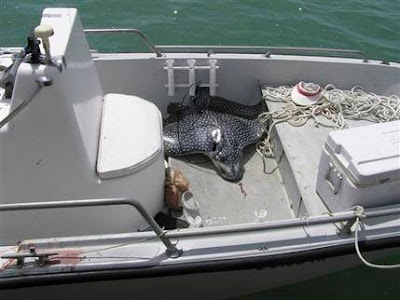 Just in today: A woman of about 55 years of age was killed by a 75 pound spotted eagle ray when it vaulted out of the water and into the boat she was sunbathing on. It's not clear yet whether the ray's poisonous spine caused her death, whether it was from the actual collision, or whether it was from her falling and sustaining a fatal injury as a result of the encounter. Eagle rays and other fish, including mako sharks, barracuda, and sailfish, are known to jump out of the water, and have been known to accidentally or inadvertently jump into boats. However, a death, caused in this manner, is considered extremely unusual. 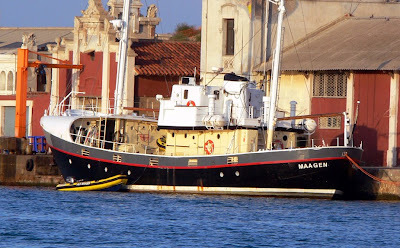 Lluis from Barcelona recently directed me to some relatively new photos of the Maagen. 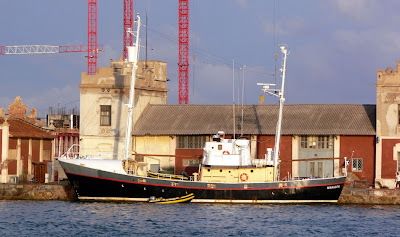 These photos come from VisualShips.com and show the vessel to be in very able condition. Lluis informs me she is heading to Greenland, her old stomping grounds, in June, where she will be in full expedition mode. I post this fine-looking vessel here because I have written about her before, in the Have Boat, Will Travel post. Gas Explosion on OSV Injures Six, Leaves One Missing. . .
An explosion involving an OSV towing a storage tank (dracone?) in the Gulf of Mexico injured six, three seriously, and left one man missing. A search is underway for the missing crewman. A Reuters report claimed the explosion occurred in the towed vessel while workers were attempting to empty gas from a section of pipeline that had been shut down. The report states the towed tank (what I'm assuming is a dracone) ruptured, causing the explosion. The OSV involved is the 175' Jullian Morrison, a 4-point dive support vessel built by Eastern Shipbuilding and owned by Chet Morrison Contractors. She is inspected and certified for 34 persons. The post below about the fisherman who had to swim 9 miles to the beach to get help for his crew mates got me thinking about being prepared for the worst -- sudden and catastrophic loss of stability! I know or have met more than a few mariners who have ended up treading water without a moment's notice. In one case, a drag wire sawed a hole in the vessel's quarter. The lazarette filled with seawater before anybody knew what was happening. Vessel rolled and sank. They were lucky. They all got out in time. Another time a small dragger took a freak wave over the stern while they were trying to boat a heavy bag of fish. Fish trays and polyballs on deck covered the scuppers and freeing ports. The vessel got top heavy and rolled. I know of two other guys who lost their vessels to hangs. I wish I could say everyone survived these mishaps but I can't. What's more, even though these vessels were USCG Safety and SOLAS equipped and fully compliant, not all equipment performed as expected. In one case, the EPIRB didn't go off. In another case, the raft got hung up in the vessel's rigging. In a third case, some of the flares in a compliant and inspected life raft were duds. So, what's a mariner to do to be prepared for sudden and catastrophic loss of stability? 1. Rig a jump bag! A jump bag has personalized emergency supplies in it, including flares, VHF-handheld, meds, sunglasses, mirror, suntan lotion, fresh water, granola bars, knife and sheath, etc., and should be located where it can be grabbed in an instant. This is in addition to the USCG required flare kit, survival suits, PFDs and the equipment included in a life raft. 2. Keep life rafts and EPIRBs fully compliant and located where they can float free if the vessel rolls. 3. Maintain a schedule of communications with the mainland so that someone will know when to start worrying. 4. Locate your survival suits topside in an easily accessible place. If the vessel suddenly loses stability and starts to roll -- even if you don't have time to get in one on deck -- you can grab it and throw it overboard. Believe it or not, it's almost as easy to get into one in the water as it is to get into one on a sinking vessel. 5. Speaking of which, conduct abandon ship drills where you and your crew practice grabbing all survival gear and getting off the boat in as little as two minutes. Take your survival suits to a swimming pool and practice getting in and out of them in the water. Better yet, sign up for an STCW BST class. At the very least, take the personal survival module (Life Raft and Survival Suits) and the First Aid module. 6. Make sure every crew member knows how to navigate, use the radio, and run the boat. 7. Read the life raft manual and instruction sheet every year. If possible, go with your raft when it gets repacked. The company that repacks it will let you inflate your raft and show you what's in it and where it's stored. 9. Light a flare off right away. At least one, maybe two. Then wait. The sooner someone knows where you are, the better your chance of survival. Even if there's nobody around to see the flare, it is still a good bet to fire off a flare as soon as possible. 10. Have a plan and stick to it. Keep cool. Establish a watch and lookout. Be positive. 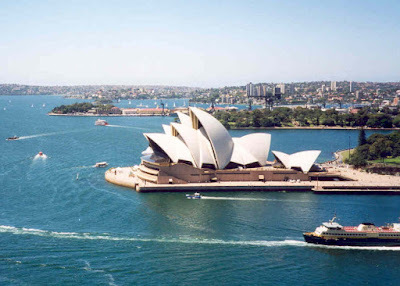 Did you read the report from Australia at the end of February about the fisherman who swam 12 hours to get help for two crew mates who were left bobbing on a cooler-lid nine miles from shore? The three were dragging for shrimp when their net got hung up on bottom. The hang rolled the boat and sank it within minutes. The guy who swam to shore made it to a beach and collapsed. He was found in an exhausted state but his heroic effort sparked a search that brought rescue teams to the scene of the accident. A second crewman was found and airlifted to safety. He had been in the water a total of 30 hours. The third crewman, the captain, was in a weakened state due to cancer treatment; he had drifted away from the cooler-lid and drowned. The BBC story mentioned that all three fishermen were experienced mariners. Far be it from me to speculate and second guess these poor souls, but I find this statement inadequate. Why did the one crewman choose to violate the three basic survival principles (stay with the vessel or as close as possible to where the vessel sank, stay together, and don’t try to swim to shore) by attempting a nine-mile swim alone? There was no mayday sent out, and nobody else had any idea where they were. The boat sank fast and the crew had no flares or means of attracting attention. They were virtually treading water, aided by a piece of flotsam that couldn’t support the three of them. Holding onto their cooler and swimming together as a group would have increased their chances of being spotted. It tripled their visible footprint in the water and tripled their lookout capability. They would have had the added advantage of three against one, and they could have help each other out and defended against predators together. Two men have a better chance to survive than one. Three have a better chance than two, as long as they all work together. But this didn’t happen, and I suspect it was a matter of the strongest man choosing between treading water and swimming to shore. Basically, he let the two weaker crewmembers have the only means of flotation, meager as it was. I have no doubt this man’s act was a heroic one. He beat the odds and the elements, and enabled the rescue of his crewmate, whom more than likely would have died otherwise. 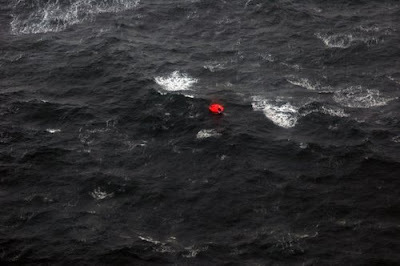 And maybe, despite the basics, the decision for one man to swim to shore alone was the crews’ best chance at survival. Clearly, it was a combination of iron will and pure luck. I don’t know about you, but I’d rather be prepared than have to count on luck. As Abraham Lincoln once said: "If I had six hours to chop down a tree, I'd spend the first four sharpening the axe."